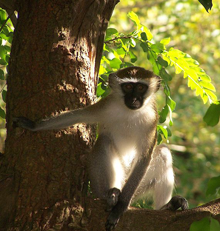 A vervet monkey (Chlorocebus pygerythrus) in Tanzania. There are five distinct subspecies of vervets, all known for their alarm calls. They issue different calls for different kinds of predators, including leopards, snakes, and eagles. Naturally, they focus on predators of particular interest to them, but forest travelers who hear and understand the calls can determine which kind of predator is nearby. Supervisors can be similarly attuned to the changes in behavior of the people they supervise. They can become adept at detecting bullying indirectly, and beyond that, they can even tell what kind of bullying is happening and how intense it is. Photo of Vervet taken in Dar es Salaam, Tanzania by Alexander Landfair, and available at Wikipedia. When we discover bullying at work we sometimes ask supervisors, "Why did you let this go on for so long?" In their own defense, those we question sometimes respond, "I had no idea," or "How could I have known?" Unless these supervisors witnessed bullying incidents, we sometimes regard such responses as reasonable. But that standard — first-person eye witnessing of bullying incidents — is a low bar when measuring supervisors' performance. Supervisors have many possible ways to detect bullying. Here are just a few examples of indicators of bullying. A complaint about bullying is perhaps the most glaring, flashing-red-light indicator of bullying. Yet some managers deal with complaints by placing the burden of proof on the complainant. Certainly a complaint isn't proof, but a complaint or a pattern of complaints ought to trigger a thorough, impartial investigation. When one individual expresses or manifests a reluctance to interact with another, distaste is one possible explanation. Bullying of the first individual by the second is another. Sudden declines in someone's work performance can arise from many factors. Being bullied is one possibility. If the person in question has also been newly isolated socially, bullying is more likely. When several people are affected, all could be targets, or some could be upset bystanders. Targets of bullies sometimes seek temporary respite from abuse by calling in sick or taking vacation or unpaid leave. Sudden changes in patterns of leave taking can indicate bullying. bullying is a possible explanationsometimes avoid their bullies by changing their work schedules. Bullies can respond by adjusting theirs to match. Watch for these adjustments. Desire for travel isn't unusual, but when someone suddenly starts volunteering for undesirable travel, bullying is a possible explanation. If the volunteer is the bully, the target might be resident at the remote site. If the volunteer is the target, the bully might be co-resident with the target, and the target might be fleeing by traveling. Reassignment can involve internal transfer at the same site, or even more drastically, relocation. Either can be motivated by factors other than being bullied. But bullying can be a motivator too. Beyond travel or reassignment, there is always quitting altogether. The more depressed the job market is, the more likely is being bullied a possible reason for voluntary termination or early retirement. Another significant change one can observe in targets of bullies is a change of affect, which is the psychologist's word for manner or demeanor. Targets of bullies often display withdrawal, low energy, loss of initiative, and most of all, absence of joy. Would you like to see your comments posted here? rbrenQHDPLQrCMqwNkTcGner@ChaclASKuXtoFiVeVCAhoCanyon.comSend me your comments by email, or by Web form. I offer email and telephone coaching at both corporate and individual rates. Contact Rick for details at rbrenGHBKmksbeAFMpfwLner@ChacutVSblcdbbLwcrjMoCanyon.com or (650) 787-6475, or toll-free in the continental US at (866) 378-5470.